The art of Bonsai growing is for the dedicated and patient gardener. This is not a plant in spring - enjoy in summer project. Growing a Bonsai tree to maturity can take up to 7 years and longer. Bonsai is enjoying a return to popularity among avid hobbyists. Almost any tree or shrub can be used to create Bonsai by careful pruning, including the roots, wiring the trunk and branches to achieve the desired proportional effect. To begin training your Bonsai, you need to start with a very small plant or cutting and a shallow container. Because you are working with very little soil and the plants need frequent watering, only planting medium made especially for Bonsai culture should be used. Just like a regular size tree, Bonsai requires fertilizer. If you are growing the plants inside, you must provide an area that receives adequate sunlight for the species. Humidity is essential and can be provided by setting the container in a pan filled with pebbles and water. 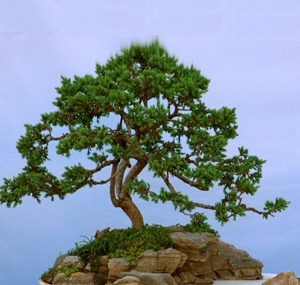 Good subjects for Bonsai growing are plants with naturally small leaves include juniper, crepe myrtle, small-needled conifers, oak, cherry, plum, azalea, Japanese maple, flowering crab and many others. Your plant should have a wide trunk, tapering smoothly to the top with multiple branches starting low on the trunk. Shaping is achieved by winding copper wire around the trunk and branches and then bending them to the desired form. Check the wire often to make sure it does not bite into the bark. Rewire as needed. Once the trunk or branch holds its shape, you can remove the wire. There are many sources of information on how to grow Bonsai as well as specialty outlets where you can select containers and materials made especially for Bonsai.